GP White, Recollections Black. 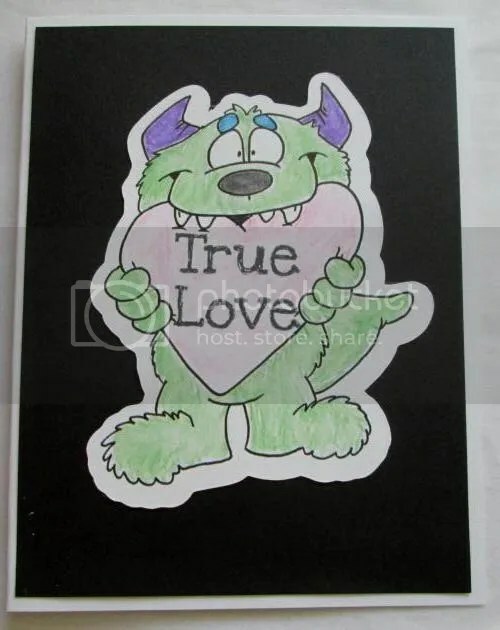 Dustin Pike Valentine’s Day Monster in Stampin’ Up Watercolor Pencils with a Tim Holtz water brush. TPC Studio Hugs & Kisses in Memento Tuxedo Black. The 15th challenge is hosted by Becca at Expressions Blog. 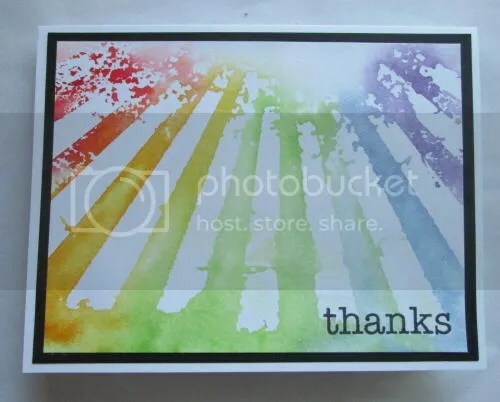 Create a card for a teen. I cased her off kilter style card for mine. Recollections Black & brads, Xerox Flecs Cover, We R Storytime – Gretel. GP white. Distress Inks Peacock Feathers. Lawn Fawn A Birdie Told Me and Studio G in Memento Tuxedo Black. No id sequins. The Precious. 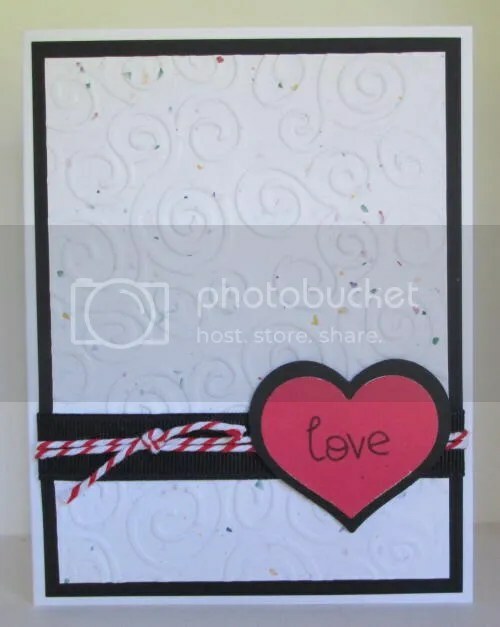 The 14th challenge is hosted by Annette – make a Thick Any Hero Card and a Thin version for a hero to send home. To be honest, neither of these is fully asembled. 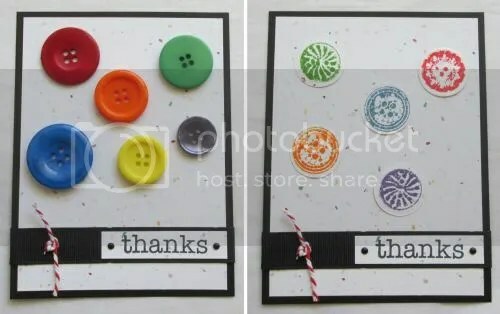 I used the buttons on the first to represent Thick, and the stamped buttons to represent thin. The AnyHero cards I make feature pictures of my dog. Still, a good exercise in looking out for elements and embellishments that won’t work for cards for heros to send home. Recollections Black & brads, Xerox Flecs Cover. No ID ribbon. Pick Your Plum Baker’s Twine. Vintage buttons. Inkadinkadoo Button stamps in Distress Inks Barn Door, Spiced Marmalade, Mowed Lawn, Faded Jeans and Dusty Concord. The thirteenth challenge is the weekly sketch challenge – #232. GP White, Recollections Black & brads, TPC Studio Class of 2011, Xerox Flecs Cover. 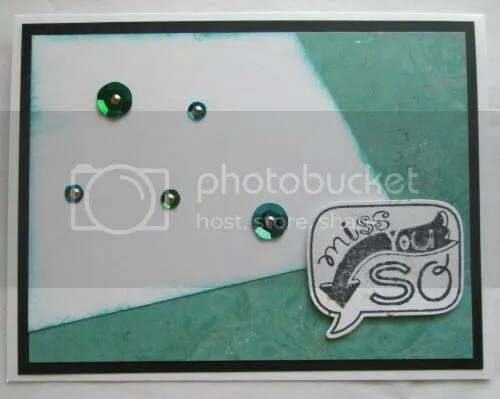 MFT You Amews Me in Memento Tuxedo Blac & Stampin’ Up watercolor pensils with a Tim Holtz water brush. Silhouette scallop. The twelth challenge is being hosted at Tami’s Craft Connection. 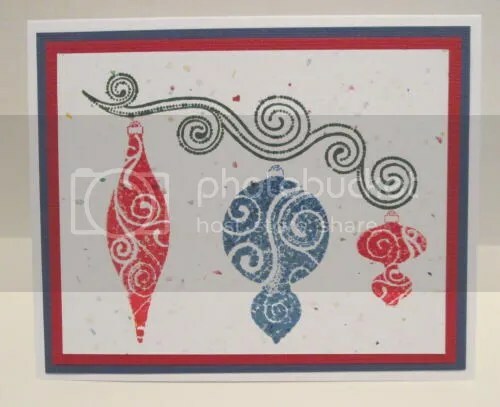 Make a Red White and Blue Christmas card. GP White, TPC Color Connect Texture Dark Blue, Bazzill Textured Red, Xerox Flecs Cover. TPC Studio Christmas Glamour in American Crafts Pigment Ink Pine & Distress Inks Barn Door and Faded Jeans with Hampton Arts Embossing Powder. 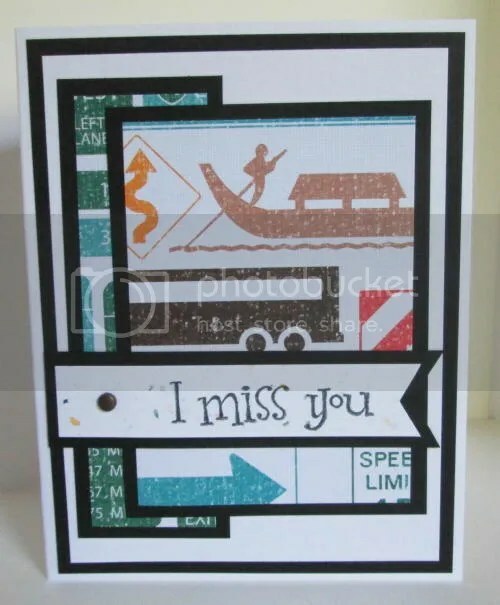 The eleventh challenge is being hosted by Marilyn at Blessed Creativity – make a card with a transportation theme. GP White, Recollections Black & brad, Xerox Flecs Cover, DCWV Pressed Petals Journey. 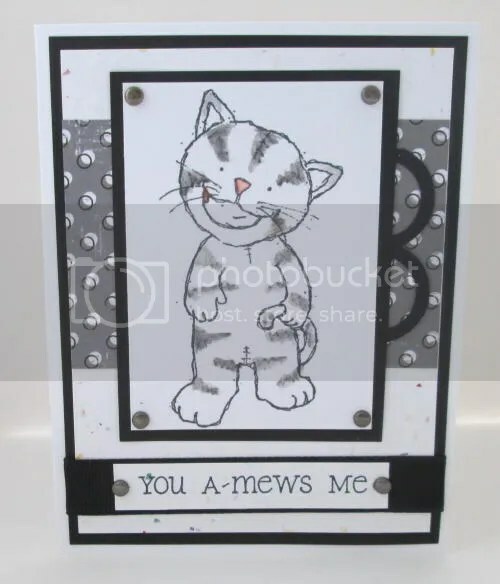 TPC Studio Whimsy Greetings in Memento Tuxedo Black. 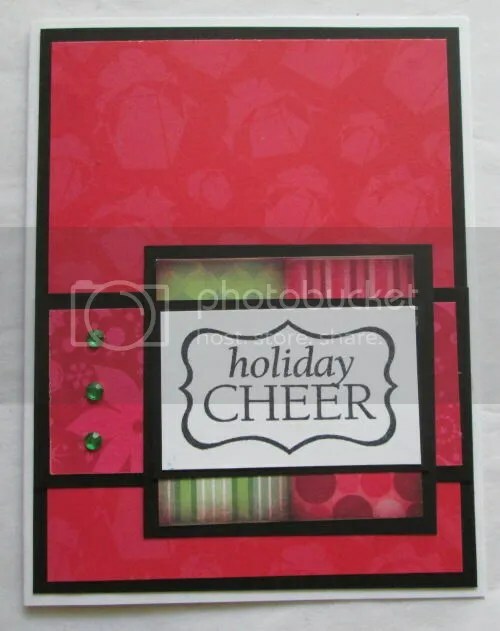 The tenth challenge is being hosted by Bobbi’s Treasure – make a card with at least three different textures on it. I have six textures – 3 base layers, dry embossing, ribbon, twine, distressed edges & dimension. GP White, Recollections Black, Xerox Flecs Cover, Colorbok red, Sizzix Sizzlits Hearts 2 & 3. Lawn Fawn Chit Chat love in Tuxedo Black. 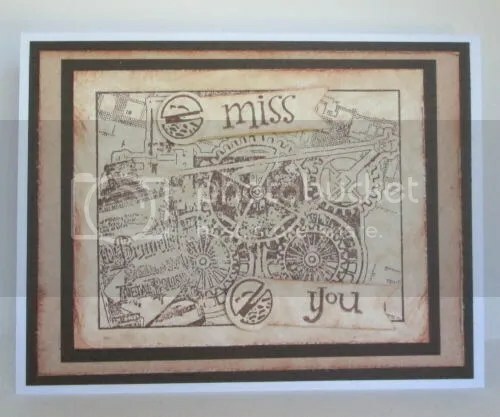 Tim Holtz embossing folder & edge distresser. No ID grosgrain ribbon, Pick Your Plum baker’s twine. The Precious.